Examples of the projects selected include a sensory feedback system for phantom pains, a new technology for micro motors, a control system for e-bikes that extends battery autonomy, a distance communication system for drones and a valuation tool for start-ups based on artificial intelligence. The companies will be supported in the so-called Phase 1 of the SME Instrument, which means that each of the 239 projects will receive €50.000 to draft a business plan. Several companies can team up to propose one project. The companies will also receive free coaching and business acceleration services. The majority of the companies selected for funding are in the field of information and communication technology (ICT), health and engineering. Most companies are based in Spain (48), Italy (21) and France (18). The European Commission received 2149 proposals for the 3 May cut-off. The next application deadline for SME Instrument Phase 1 is on 5 September 2018. 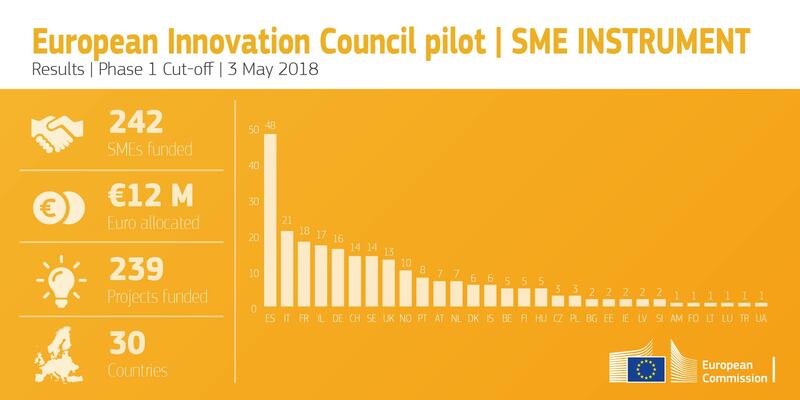 The SME Instrument is part of the European Innovation Council (EIC) pilot that supports top-class innovators, entrepreneurs, small companies and scientists with funding opportunities and acceleration services. Companies can apply for two distinct phases under the SME Instrument, depending on the maturity of their innovation. Under Phase 1 of SME Instrument, each project receives a lump-sum of €50.000 to carry out a feasibility study. Under Phase 2, each project receives from €0.5 to €2.5 million to finance innovation activities such as demonstration, testing, piloting and scaling up. In addition, companies under both phases can benefit from free coaching and business acceleration services.